Dubbed the “No. 1 Friendliest City in America in 2013″ by the readers of Travel Leisure magazine, Nashville is a welcoming and pleasant town, according to Estately Blog. Aside from Nashville’s kind nature, the city is also known for its strong job market, low cost of living and high quality of life. Given these attractive features, 85 people move to the music city every day, Nestling in Nashville reported. Last year, 9,410 people migrated to Nashville from Memphis, 7,083 from Los Angeles and 6,960 from Atlanta, according the Nashville Area Chamber of Commerce’s “Nashville Datascape 2013.” Thousands of newcomers also hailed from Chicago, Miami, Detroit and Dallas. The Nashville Chamber of Commerce indicated the city offers a diverse range of job opportunities. The food service industry is booming. In 2012, there were 6,580 food service jobs in Nashville, and by 2022, there will be an estimated 20,572. By 2022, there will be 3,017 more jobs in the accounting and auditing field. Personal financial advisors also have ample opportunities in Nashville; by 2022 there will be 9,715 jobs related to this profession, which is up from 6,423 in 2012. The average annual salary is also climbing. Back in 2007, on average, people brought in $37,970, and in 2012, the average salary was $41,810. With the rise in salaries and the job growth, Nashville is transforming into a financial haven. The area is particularly attractive for younger generations, as 33.2 percent of individuals in Nashville are under age 25, according to the Nashville Area Chamber of Commerce. Today, many Gen Y’ers and X’ers are moving to this up-and-coming town. 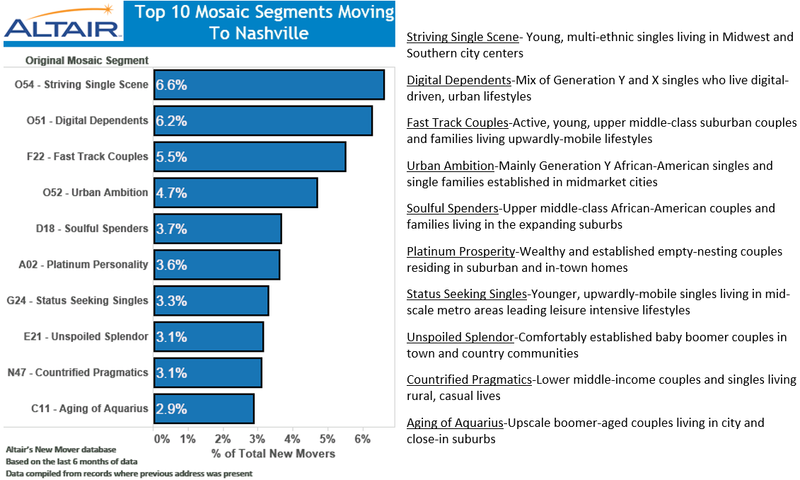 For example, 6.6 percent of people who migrated to Nashville are part of the “striving single scene.” This demographic is comprised of young, multi-ethnic singles residing in Midwest and Southern city centers. A tech-savvy crowd is also planting its roots in the thriving Tennessee city. In fact, 6.2 percent of movers are from this “digital dependents” bracket, which is a blend of Generation Y and X singles who live urban and digital-heavy lifestyles. Another young demographic that is settling down in the city is “status-seeking singles.” These upwardly mobile individuals prefer to lead leisurely lifestyles and enjoy residing in mid-scale metro areas. Additionally, 4.7 percent of movers are made up of young African-American singles who seek mid-market cities. Nashville has garnered a lot of attention within the past couple years and is considered the nation’s “it” city, according to The New York Times. From the wonderful weather to the booming entrepreneurial scene, the city is becoming a hub for younger generations. 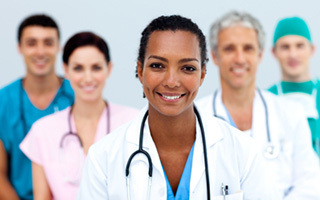 This entry was posted in Medical Marketing and tagged Healthcare Marketing, In the News, Patient Insights. Bookmark the permalink.